The general elections organised on the 11th of December 2016 in Romania have seen the lowest level of participation since the fall of communism in December 1989. Winning 46% of votes, a coalition made of PSD (Social-Democratic Party) together with a smaller social-liberal party (ALDE) managed to get the simple majority of seats in the Romanian Parliament. The formation of the Government proved to be somewhat difficult as the leader of PSD could not become Prime Minister due to integrity problems. Indeed, in April 2016 he had been convicted for electoral fraud during a 2012 referendum. He therefore had to cede the position to a rather unknown party member, who managed to get a vote of confidence in Parliament on the 5th of January 2017. But this was not to be the only hurdle faced by the winning coalition after the elections. Having won on a platform based on generous promises of taxes dropping and salaries raising, the agenda of the coalition also included an ambitious re-centering of national politics on identity issues while concealing other aspects such as the need and urge to solve integrity problems of its members. However, this objective became clear rather soon. Arguing that Romania is imminently facing a condemnation by the European Court on Human Rights due to the dramatic conditions in its prisons, the Government attempted to adopt an emergency ordinance on collective pardon that would have concerned prisoners serving sentences shorter than five years, some of them for crimes related to corruption. Emergency ordinances are acts of delegated legislation provided for by article 115 of the Romanian Constitution. They can be adopted by Government even without an explicit habilitation from Parliament but only in exceptional cases, the regulation of which cannot be postponed, and for the emergency status of which the Government has the obligation to give the reasons within their contents. The interest of this form of legislative delegation resides in the fact that they come into force immediately, although they must be debated upon and later approved or rejected by Parliament through a law. However, faced with clear opposition from the President of Romania, strong resistance from the judicial system and confronted with mass protests of its citizens against what has been perceived as a blow against the fight against corruption, the Government changed course and promoted the collective pardon through a draft Bill in Parliament. The criminal offence of abuse in public office is revised: only offences concerning more than 200,000 RON (USD$48,000) of damages are punishable; in addition, abuse of public office cannot be enforced anymore for drafting, approving and enacting normative acts (thus favouring public officials in local and central executive and legislative authorities). The criminal offence of misconduct in public office is decriminalised. Aiding a felon in the commission of a criminal offence cannot anymore be enforced for drafting, approving and enacting of normative acts. Denouncement of criminal deeds is no longer possible should a deadline of six months pass after the commission of those deeds. The flow of events which followed are telling. Two weeks after the appointment of the new Government, on 18th of January, the President of Romania attended the weekly meeting of the Government because rumours had it that the two emergency ordinances could have been adopted despite not being on the agenda and not having respected the legal requirements on transparency and legal technique. Caught red-handed, the Prime Minister declared there were no such intentions, but some legal documents had been prepared so that same day the two emergency ordinances were published on the official website of the Ministry of Justice. They were also sent to the public authorities that have to provide legal opinions according to the Romanian legal technique. The next week, various judicial bodies (the President of the High Court of Cassation and Justice, the General Prosecutor, the Chief Prosecutors of the National Directorate for Anti-Corruption and of the Directorate for Investigating Organized Crime and Terrorism) publicly presented their negative remarks on the two emergency ordinances. In addition, the very day when the Government held meeting, the European Commission released its CVM Progress Report on Romania, COM(2017) 44 final, noting at page 5 that some recent evolutions in the country may raise concerns on the grounds of weakening the legal framework on corruption. By that time, mass protests started to become regular. On 30th of January, the Ministry of Justice organised a public debate concerning the two draft emergency ordinances and declared its good will to take into account suggestions received. But in the evening of the 31st of January, at around 9 pm, a Government meeting was organised in order to approve the draft law on the state budget. On this occasion, without any prior announcement, the Government adopted a draft law to be sent to Parliament on collective pardon and an emergency ordinance to revise the criminal codes. Deep into the night, at around 1:20 am on 1st of February, emergency ordinance 13/2017 was published in the Official Journal thus coming into force that very day. Within half an hour, protesters flooded the square in front of the Government’s headquarters. Over the next 15 days the public square in front of the Government’s headquarters has been the scene of the biggest protests known in Romania since the fall of communism. In particular, on Sunday the 5th of February, more than 600,000 people lighted their mobile phones at 9 pm in an attempt to explain to Government how it should “act in full daylight”. This happened in public squares in virtually all cities across Romania. On the 1st and 2nd of February, the Superior Council of Magistracy and the President of Romania lodged institutional complaints with the Constitutional Court asking it to sanction the Government for abuse of power, while the Ombudsman asked the Constitutional Court to declare void the effects of the emergency ordinance. Faced with mass protests and virulent reactions inside and outside Romania (in a Joint Statement of President Juncker and First Vice-President Timmermans on the fight against corruption in Romania “the Commission warns against backtracking”) on Sunday the 5th of February, the Government abrogated emergency ordinance 13/2017 through emergency ordinance 14/2017. Being merely delegated legislation, both emergency ordinances have now to be debated and decided upon by Parliament. But the saga did not stop here. On the 8th of February the Constitutional Court decided that the Government did not infringe the legislative powers of Parliament when adopting emergency ordinance 13/2017. On the 9th of February it also rejected the constitutional complaint of the Ombudsman as irrelevant because meanwhile the emergency ordinance had been abrogated. And on the 14th of February the Parliament adopted a law confirming the emergency ordinance 14/2017 which abrogated emergency ordinance 13/2017. On one hand, there is a general lack of confidence in the current Government, who managed the sad performance of antagonising important parts of the population in less than two months after the vote of confidence. On the other hand, there are the legal niceties and legislative technique, which make it so that as long as the emergency ordinance 13/2017 has not been rejected by Parliament there is still a danger it will become enforceable law. And Parliament, where the governing coalition holds more than the simple majority of seats, has cleverly dissociated the rejection of emergency ordinance 13/2017 from the approval of emergency ordinance 14/2017. Last but not least, the just discovered civism of Romanians astonished even them and, while still learning how to properly make use of it, the pressure put by the civil society on state authorities and institutions is now considered a useful monitoring tool, able to stir democratic changes. From a legal perspective, the emergency ordinance 13/2017 attempted a major change in the criminal public policy of the Romanian state. The adoption of a new Criminal Code and a new Criminal Procedural Code in 2009 established a firm and pro-active criminal public policy by granting stronger investigatory powers to prosecutors, thus proving the commitment of the Romanian state to dealing with endemic corruption affecting economy and society. This trend is about to be changed by the new parliamentary coalition, whose leaders have been affected by the anti-corruption fight. For the moment, two different (and apparently incompatible) trends concerning criminal public policy in Romania seem to take shape: on one hand, the judiciary and a significant part of the population, supported by the President of Romania and, rather weakly, by opposition parties in Parliament favour a strong stance against corruption, while on the other hand, the coalition in power, legitimised by the popular vote and supported by strong media outlets, favour a softer approach. 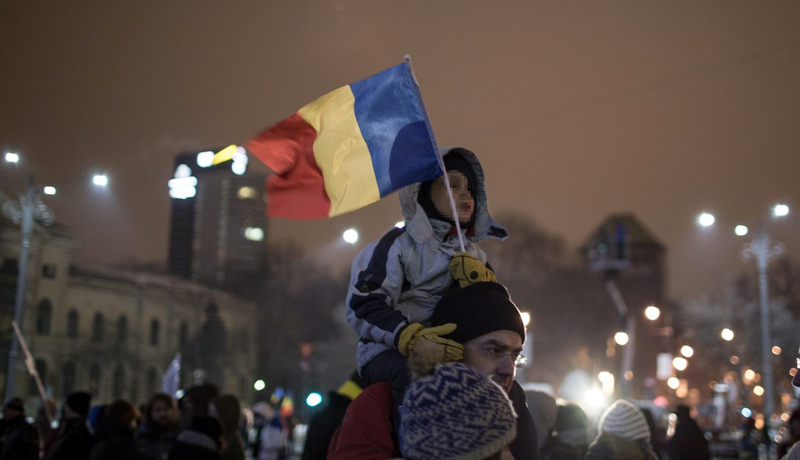 It is interesting to note that public protests in Romania are not necessarily linked to and do not necessarily wish to interfere with public policies. They are rather the sign of a recently awoken civil society who voices its concern with regard to what it has perceived as a possible reversal of the state governed by the rule of law. Emergency ordinance 13/2017 is a test for the solidity of the rule of law in Romania both on accounts of form and substance and the fact that large parts of the population have sensed this as a danger is a sign of the maturity of democracy in Romania. And despite the rather controversial rulings of the Constitutional Court and the reluctance of the governing coalition to solve the legal mess it has created, the mass protests have not contested the core values or institutions of the rule of law. On the contrary, they have supported and underlined them, asking public authorities and officials to abide by the law and respect democracy. Moreover, it seems that the Constitutional Court is becoming the ultimate arbiter not only in matters referring to the validity of laws or protection of fundamental rights, but also on institutional disputes between powers of the state and even in public policy issues such as the approach to be taken with regard to combating criminal conduct. The judicialisation of the public sphere is thus almost accomplished in Romania, putting somewhat behind other concerns such as illiberal democracies (largely debated in the cases of Poland in 2016 or Hungary in 2013), populism (no such political party passed the electoral threshold in Romania in December 2016), or post-truth (despite inherently exalted political declarations none of the political or institutional actors involved in this saga contradicted the facts as presented above). Elena Simina Tănăsescu is Professor of constitutional law and EU law at the Law Faculty of the University of Bucharest and Director of the Centre for Constitutional Law and Political Institutions (www.cdcip.ro). She is a member of the Group of Independent Experts on the European Charter of Local Self Government at the Council of Europe and President of the Romanian Association of Constitutional Law and of the Franco-Romanian Association of Lawyers. Cross-posted with the kind permission of IACL, AIDC Blog and of the author. Original post.